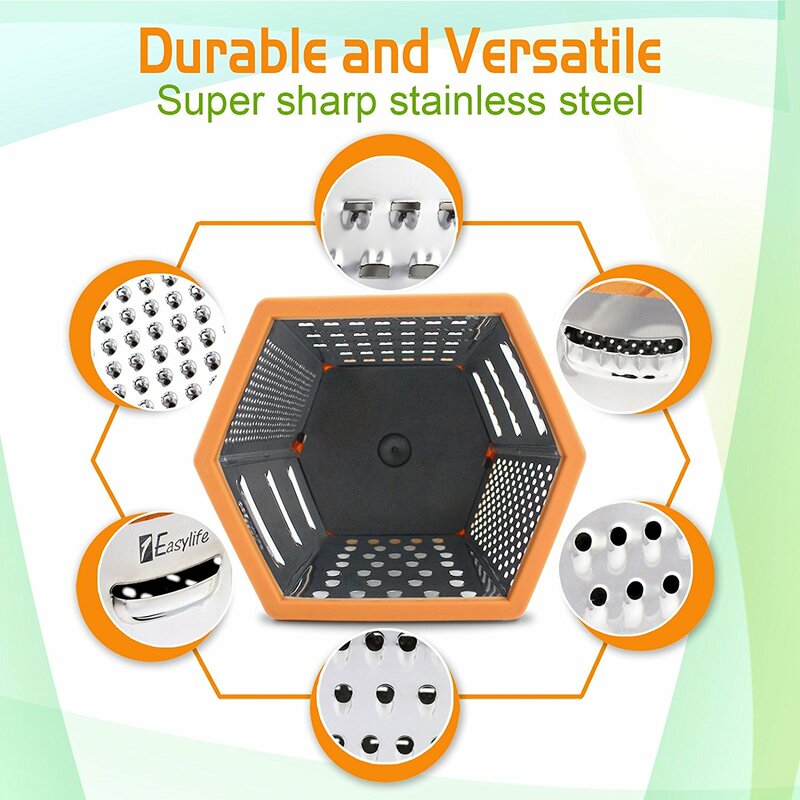 ★ Super Sharp & Durable Stainless Steel Blades for Easy Grating - Premium Stainless steel material makes it can grate more with less effort and less time. 6-in-1 surface is design to last long and backed by 1Easylife 18 Month Warranty and 90 Day Money Back Guarantee! 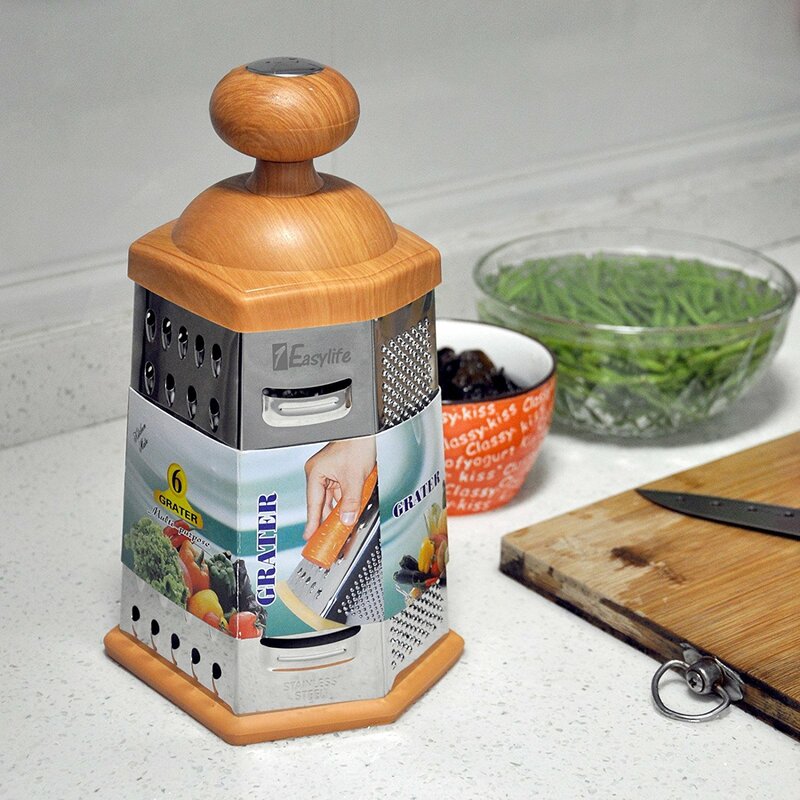 ★ Beautiful Woodlike Top Would Look Great in Any Kitchen - Kitchen working should not be filled with dull black or silver, ispired by natural wood, we add the wood element in this box grater. You will love the beautiful appearance on the top which is also comfortable to grip when you use the grater. Even worth giving as a gift! 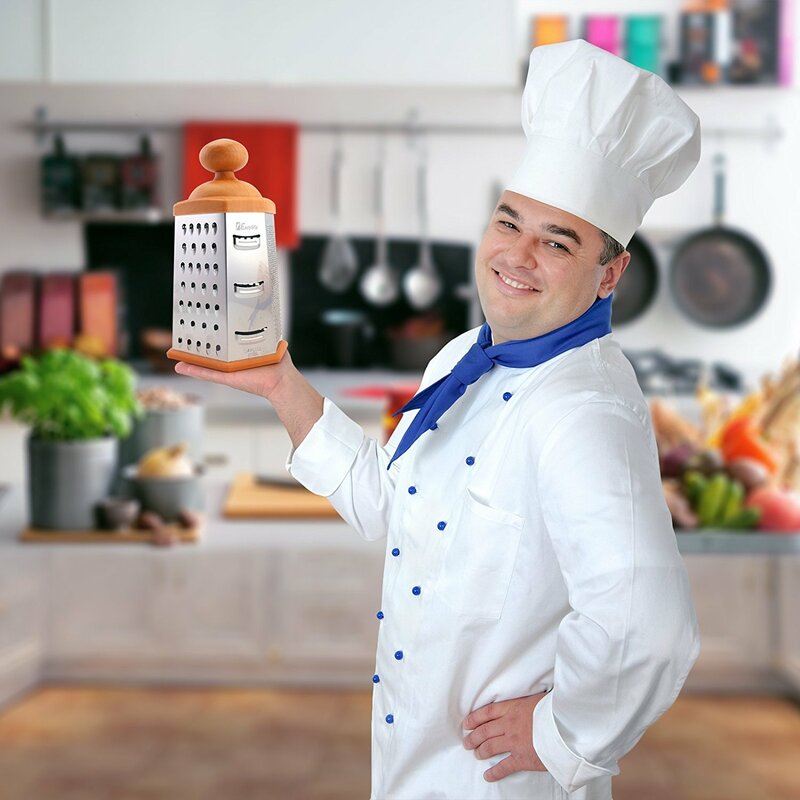 ★ 6 Sided & Large 10” Box Grater - This 10” tall box grater has fine, extra-fine, coarse, ultra-coarse, shred and slicing surfaces you always find what you need for your cooking. Great for thin julienne, for grating soft or hard cheese or even for nuts or zest. 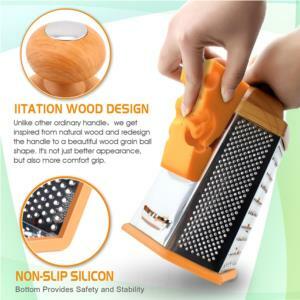 ★ Non Slip Silicone End for Safety & Stability - Paired together with the solid ergonomic handle on the top, you get a stable grip on this large grater so it doesn't slip out from underneath you while you work. 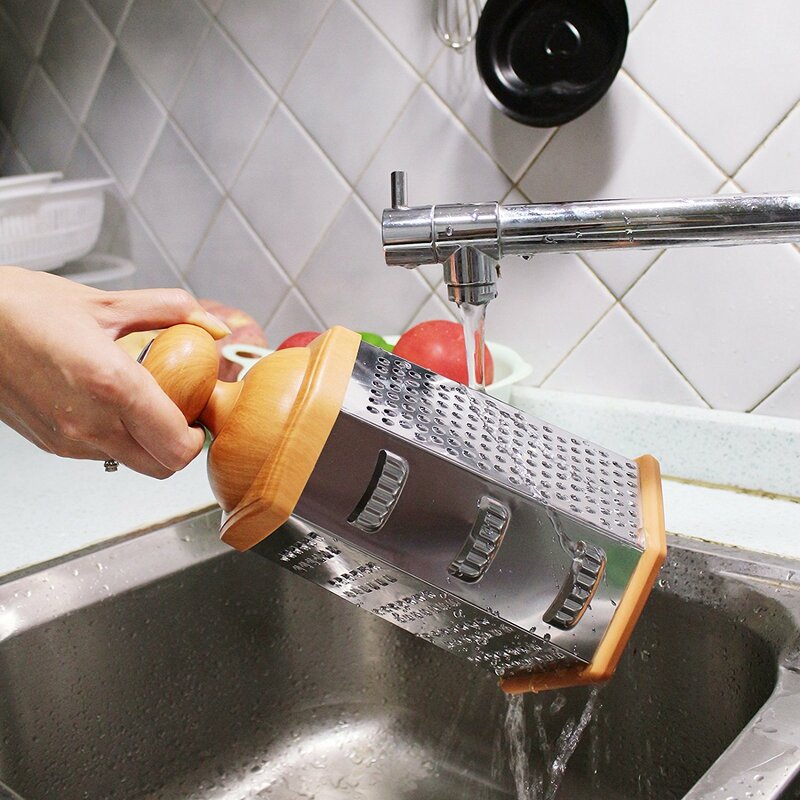 ★ Easy-to-Clean - Ultimate grating experience with easy to clean Grater box just place it under the running water and scrub lightly with a soft sponge. This box grater doesn’t required lot of scrubbing with a brush to clean off all of the little holes or just toss it in the dishwasher. 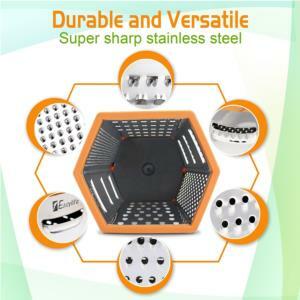 Why Choose the 1Easylife H792 Wood-like Cheese Box Grater? There are hundreds of cheese graters available in the market, but not all graters are created equal and Stunningly. 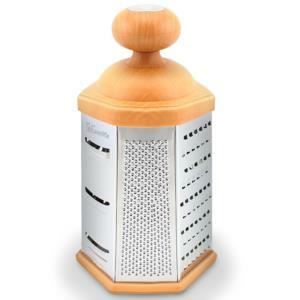 Only 1Easylife’s H792 Cheese Box Graters work greatly, but also looks delightful on your countertop. Now, you can grate more with less effort with 1Easylife H792 Stainless Steel 6-side Cheese Box Grater and make quick work of even the hardest cheeses. 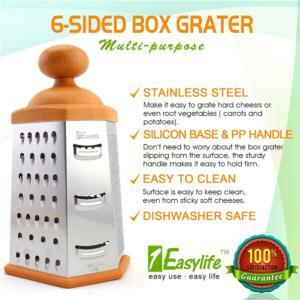 End the Searching for a Safe, Sharp, and Beautiful Grater, 1Easylife H792 Is Definitely The Best Choice! How wide are the ultra-coarse and shred cutting openings? Both Large grate and shred are approx 5mm "diameter" as I was able to measure them. I put mine on the top rack and it was fine, but I don't recall it saying anywhere on the packaging if it was dishwasher safe or not. Can I use it for Carrot salad ? Would you use it for a carrot salad? Of course why wouldn't you.. Does the 10" height include the handle? Does it seem to have enough height on the grating sides for easy, efficient grating? Yes the height includes the handle. It has more than enough room to efficiently grate whatever you want. This is the only grater I use and it is very sharp. You get a very cheaply made grater. Not that sharp this thing ether. Very thin steel, bends with little pressure, the rubber bit on the bottom is a bit flimsy and wants to come off every time. I'd get something more substantial next time.UPDATE: As a result of the above review i was offered a replacement by the seller. The replacement grater arrived promptly and I must admit performed much better. Apparently there was a glitch of some sort in quality control and defect in the welding was overlooked or something along the lines. Anyway, the second one did a good job of doing whatever graters do in the kitchen and I have no complaints about the sellers customer service - that was very kind and thoughtful of them to react to my humble opinion in such a generous and helpful way. Will buy again from them with no reservations. Best cheese grater I've ever used.Super sharp and it has a rubber base so it doesn't slip on the counter when using it.The top handle is wood it is very easy to hold in place with the round design.It has all the different types of slices available as well,I would recommend to everyone who enjoys cooking. 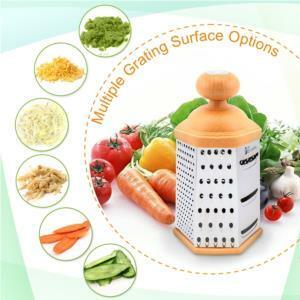 This Easylife 6-sided Grater is the best grater. The top nob is a very comfortable and safe handle . The cutting edges are sharp. 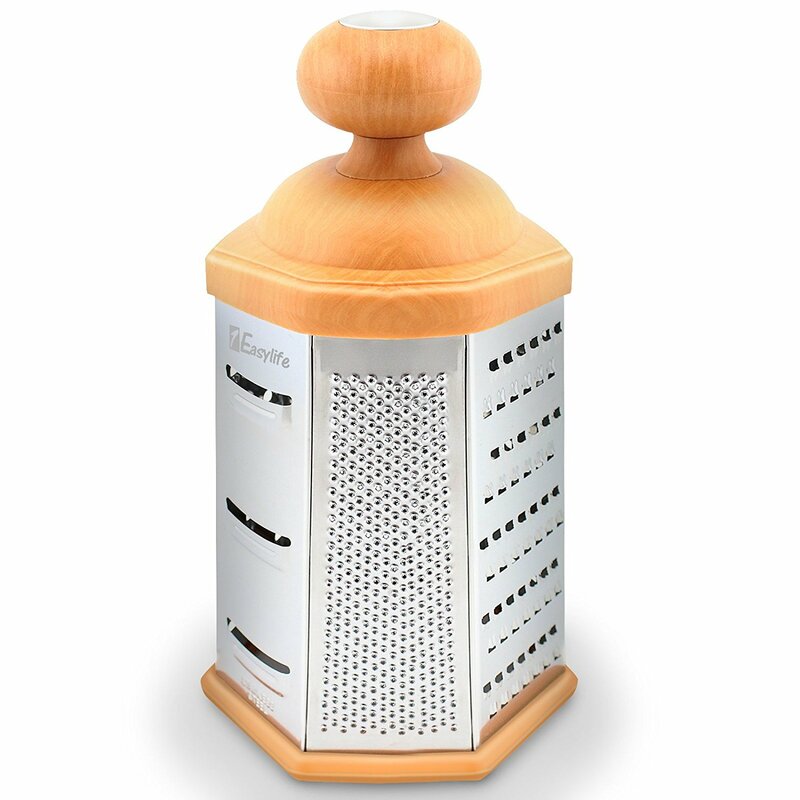 The grater is good looking and can be left out as a kitchen ornament that is also the best grater you'll ever own.If all you have is some poorly made non-ergonomic grater that cuts your fingers every time you use it...well, you need this grater. Works great. I like that there's 6 sides versus the standard 4 of most manual graters. The non-slip bottom is nice and the overall design holds up well. Grates a block of cheese in no time at all and the interior will build a nice pile for you. This is an all in one grater! I love how simple it is to use and how you can change from one size to another with just one device. Cleaning is so great! You can use all 6 sides and only have one item to clean!I would definitely recommend this for people looking for a grater! As some have said, the steel's a little thin, but the overall construction's quite sturdy, and the grater is wonderfully versatile and good-looking on the shelf.When I've had it a while, I'll let you know how it's held up. Bought this to replace my metal grater. You know the one...four-sided, knuckle buster; rusty after a few washes; thin handle. The Easylife grates Parmesean cheese like butter! Comfortable and easy to hold in place. Large interior allows for more product and no rough, sharp edges! This is a really substantial grater. The large grip on the top helps you lean into it so that you can really minimize vegetables quickly. It has been in and out of the washing machine over ten times and it is holding up like new. I am very pleased with this grater.